When I was about to publish my book Bioethics: An Introduction with Cambridge University Press (CUP). I suggested a series of short podcasts on which I could explain each of the ethical theories I discuss in chapter 4, some of the trickier philosophical concepts, and the key arguments often used against developments in biotechnology (‘it’s too risky’, ‘it’s disgusting’, ‘it’s not natural’ and ‘it’s all a matter of opinion’). My thinking was that, as most of the readers of the book would not be philosophers, they would probably value some help with these theories, concepts and arguments. CUP leapt at the idea, and the University of Oxford said they’d be happy to host the podcasts on their iTunesU site with my other podcasts. 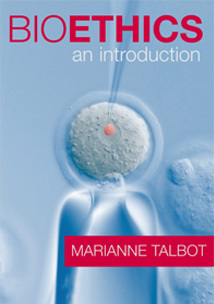 Although the book was written after I wrote OUDCE’s short online course Bioethics for Beginners (indeed it was the short course that led to the book), the podcasts and indeed the book would be helpful for anyone doing this short course. There are 9 podcasts in the series. Each is available in audio and video. Each is about 15-20 minutes long. Accompanying the series is a sheet describing where, in my book, you’ll find the material that relates to the podcast.